Being surround by water makes Seattle a wonderful place to go kayaking. There are many lakes to paddle on including Lake Union, Lake Washington and Lake Sammamish just to name a few. There are a number of guides and outfitters offering kayaking tours for all ages along with rentals and essential equipment. 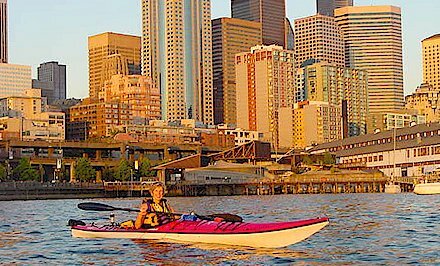 Explore this page to find information on the various kayaking guides, outfitters, tours, clubs and anything related to kayaking in the Puget Sound. Sound Rowers Open Water Rowing and Paddling Club. 4514 NE 93rd Street, Seattle, WA 98115. Washington Kayak Club. PO Box 24264, Seattle, WA 98124. Agua Verde Cafe & Paddle Club. 1303 NE Boat Street, Seattle, WA 98105. Phone: 206-545-8570. See Go Northwest! pages for sea kayaking in Washington's San Juan Islands for listings of guides and outfitters running half-day, full-day and multi-day kayaking trips featuring birding, photography, whale watching, eco-tours and forms of sea kayaking adventures.